As a music fan, you have a job to do. I know that sounds counter intuitive but hear me out. It’s not enough to listen to music and catch up on the new stuff. You gotta go back to the source as often as possible. You have to understand the lineage and the evolution and the precursors for the music that you love in the present. Sometimes it’s hard work. But that’s just how it is: music should be fun, but also homework. Sometimes this wonderful thing happens where they are both one and the same, and you’re dealing with fun homework. If you want to understand modern music, a great place to start it is folk music, and a great place to start with that is Woody Guthrie. There’s a reason why Guthrie is so revered. He sang about current events, taking his songs on the road, having a conversation with his audience. His message was one of solidarity with the worker and about patriotism before that became a loaded word. To people (both men and women) who had no voice, Guthrie gave it to them and spread it all over the country. The impact is still being felt today, almost a century later. Guthrie’s songs are still sung all over the world and being discovered by new generations. Hell, the man wrote more words than he had time to write music for, and an archive of his lyrics is being maintained for a select few to visit. Jeff Tweedy talks a little about what it was like visiting the archive and says it included some of the filthiest stuff he’s ever read. I can only imagine what it must have been like to be the man. Music that’s this important needs to be treated with love and care. And nothing says TLC quite like the folks at the Smithsonian Folkways. I mean, I think there are some great companies out there doing great archival work for collectors, but with Smithsonian Folkways you’re dealing with the mother of them all. 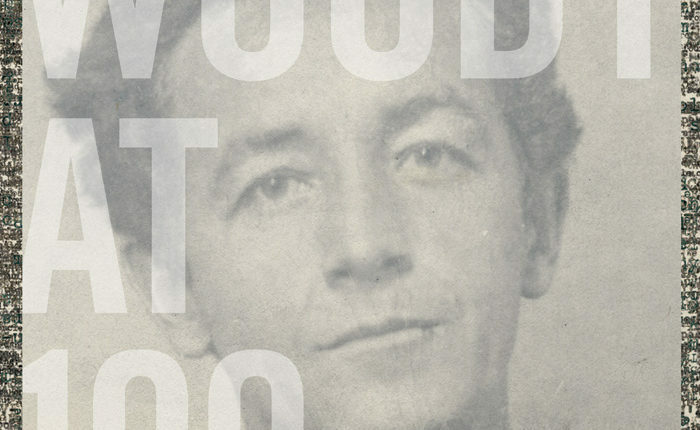 It only makes sense that for Woody Guthrie’s 100th birthday, Smithsonian Folkways put together a package this beautiful: Woody at 100: The Woody Guthrie Centennial Collection. This 3 CD collection comes in an oversized 150-page hardcover book that’s the size of a vinyl record. The CDs contain not just the essential Guthrie songs like “This Land is Your Land,” “Riding in My Car,” “Lindberg” and “Ludlow Massacr,” and “Hard Travelin’” but also 21 previously unreleased performances and 6 never-before-heard recently discovered original songs. It’s an incredible discovery, considering what a well-known performer and icon he’s been for so long. But then again, it’s been said that Guthrie wrote between 2000-3000 songs in his life. That’s an error rate of 1000 so it’s no surprise that all his songs haven’t been accounted for yet. The book itself contains tons of artwork, original drawings and paintings, tons of notes on the songs, and typewritten lyrics by the man himself. It’s just barely a snippet into this complicated person but paints a very colorful picture with what has. 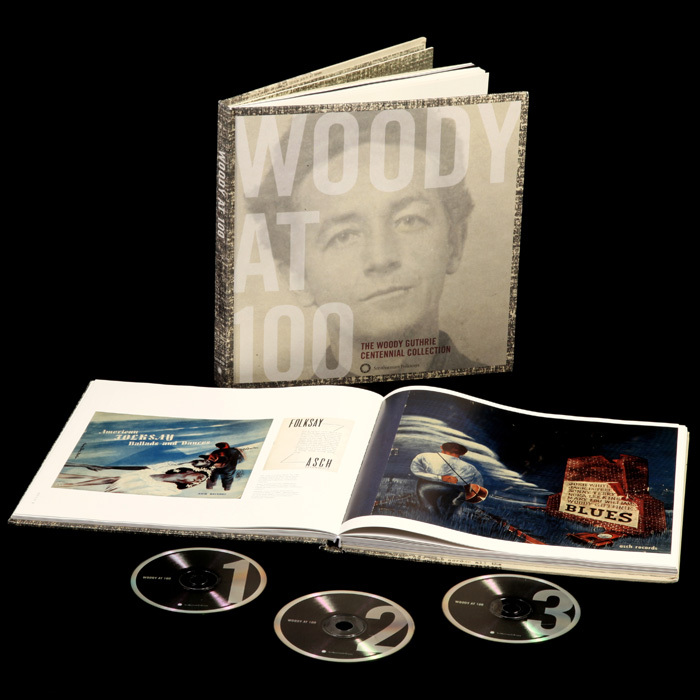 There’s no way anyone can ever truly create a comprehensive package on behind Woody Guthrie but Woody at 100 comes damn close. His music will be discovered and rediscovered for generations to come. It’s relevance and life cannot be denied. Get it from Smithsonian Folkways.